Outside of Yangon, comfortable hotel accommodation on full board, twin-share basis. Gentle walks, cultural highlights and comfortable accommodation, our Burma holidays are the best way to explore this remarkable country. This is one of the most enjoyable and interesting holidays I've ever had - due to the sights and the culture of the country (plus hotels of a very good standard & wonderful food) - but mainly the personality, knowledge and diplomacy of our guide made this trip exceptional. A good mix of cultural highlights and walks to see the country. A more 'morally' correct approach than other tours to the country - I have wanted to go for 10 years but held back until now. Enjoyed chance of meeting local people and personally preferred meals and teas in local venues rather than touristy ones. met along the way made the holiday very special. Very much enjoyed the walking aspect of the holiday. It was good to exercise as well as see the wonderful sights. Walking and meeting village people gave us a better insight into Myanmar and its people. The Bagan, Mandalay, Inle Lake itinerary couldn't fail to impress with the history, culture, scenery & amazing pagodas. Our guide was knowledgeable, enthusiastic & seemed to know everyone in Burma, so he would stop & chat & introduce us to all sorts of people along the way. He gave us an insight into the everyday life of the villagers that most tourists don't get the chance to experience. Alongside the magnificent golden Shwedagon Temple and historic colonial buildings in Yangon (Rangoon) there are three “must see” areas for the first time visitor on their holidays to Burma: Mandalay – the cultural heart of the country and inspiration to a myriad of writers and artists; Bagan – a vast plain filled with beautifully crafted temples and monuments; and Inle Lake where floating villages are home to fishermen and farmers with a way of life little changed from centuries ago. We have carefully designed this itinerary not only to discover these areas on your holidays in Burma but also the hidden gems of Pyin Oo Lwin and Kalaw; two historic British Hill stations set in beautiful countryside. Mountain Kingdoms Burma holidays take care to include all the most noteworthy sights and experiences of this incredible country, and we’ve used our years of experience to put together the best walks for you. Walks will be taken at a relaxed pace, in keeping with the itineraries of our Burma holidays, and enable us to see day-to-day life at first hand. Whilst in the hill villages we’re likely to meet locals on their way to market, be approached by curious school children eager to practice their English, and see crimson robed monks collecting alms. There’s plenty to see and experience on holidays to Burma and all the vibrancy of life in this fascinating country is on offer. In the busy more touristed areas we’ve also taken time to ensure you get the most from your holiday by visiting off the beaten track sights and carefully timing visits to major sights such as the Shwedagon Pagoda and U Bein bridge, the longest teak bridge in the world. We believe that our unique walking holidays in Burma offer you the chance to discover both the cultural splendours and the enduring traditions of this remarkable ‘Golden Land’. For accommodation, we have carefully selected hotels that are independently owned and that offer a good level of service and comfort for your holidays. Burma’s beauty, culture and hospitality await - book now to begin your journey of discovery. We can also offer Golden Trails of Burma as a private departure, following the same itinerary on dates that suit you. Prices vary by season but start from £2,595 per person, land only. International flights are available from £650. Please contact us for further details or to book your private departure. Meal arrangements: Bed and breakfast in Yangon (Rangoon) and full board elsewhere. Lunches and dinners, where included, will be taken in a mixture of local restaurants and your overnight hotels. Please note that dinners are included in Yangon for departures in Jan/Feb 2018. (Itineraries may vary by departure. Detailed Itineraries for our 2018 departues can be downloaded below). Fly to Yangon (Rangoon) sunset visit to Shwedagon Pagoda. Fly to Mandalay then drive to Pyin Oo Lwin. Walks and train ride to Gokteik Viaduct. Drive to Mandalay with sightseeing visits including U Bein Teak Bridge. A full day Cruise on Ayeyarwaddy River to Bagan (July departure – River Cruise to visit Mingun instead and fly to Bagan). Explore Bagan’s temples on foot. Fly to Heho, walks from Kalaw, transfer to Inle Lake. Walking and sightseeing around Inle Lake. Fly to Yangon (Rangoon), walking tour. 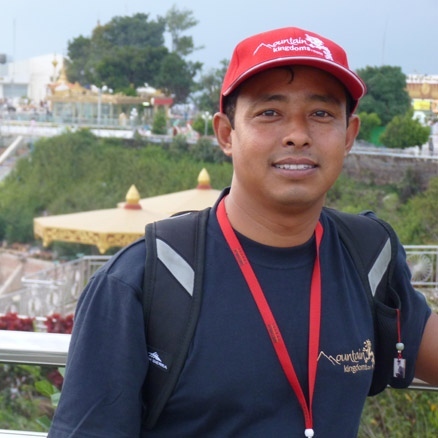 Your trip will be escorted throughout by an English speaking Burmese guide. Our Guides are all licensed to guide throughout the country and receive regular ‘top-up’ training. In addition to English, many guides will speak the dialects used by some of the ethnic groups you will encounter in rural areas – further adding to the interest and enjoyment of your holiday. Fly London to Yangon by overnight flight. Day 2 - Arrive Yangon. Sunset visit to Shwedagon Pagoda. You will be met and transferred to the Savoy Hotel - a stylish, boutique hotel furnished in colonial style - an excellent place to relax after the long flight from London. International flights normally arrive by midday so after some time to rest, you will make a sunset visit to the Shwedagon Pagoda. Famous worldwide, the golden stupa of Shwedagon ("shwe" means golden) is considered the 'heart' of Buddhist Burma. The Pagoda is believed to be 2,500 years old and the central stupa is surrounded by dozens of intricately decorated buildings, shrines and statues. There are always many Burmese people praying and making offerings at Shwedagon and it is a fascinating place to spend time just watching the world go by. The transformation from late afternoon light to evening, further adds to the spectacle and atmosphere of this wonderful temple complex. Day 3 - Fly to Mandalay. Drive to Pyin Oo Lwin. Carriage ride and afternoon hill-country walk - 3½ hours. You will make an early start today, transferring to Yangon (Rangoon) Airport for a domestic flight north to Mandalay (approx 1½ hours). The airport here is some distance from the city and your drive into the hill country to the west bypasses the city completely. The road winds steeply through flower, fruit and vegetable gardens, a journey of around 2 hours to reach Maymyo, now known as Pyin Oo Lwin, a former British Hill Station. On arrival at this bustling market town, you take a tour in one of the local horse drawn 'stage coaches' used by locals and visitors alike. Outside the central area the influence of the British becomes more apparent as you see the brick and timber houses complete with English style gables, turrets and chimneys. The Candacraig Hotel (formerly the British Club) is one such house, made famous by Paul Theroux's book, 'The Great Railway Bazaar.' Sadly this property, (now owned by the government and renamed 'Thiri Myaing Hotel') has fallen on hard times and whilst not without charm is quite run down, although there are plans for a total renovation. In the afternoon, you will have a walk in nearby countryside. After an early lunch you will drive to Pwe Kauk village, a 15 minutes drive from Pyin Oo Lwin. At Pwe Kauk village are some attractive waterfalls, known as Hampshire Falls in British times and still a popular picnic spot for local people. From Pwe Kauk you walk through pretty rolling countryside through several villages of the Shan, Danu and Burman ethnic groups. This is a very fertile area where they grow a wide range of crops such as rice, carrots and other vegetables, fruit such as damsons, oranges and strawberries as well as coffee, macadamia nuts, sandalwood, mustard and flowers. En route you will visit the attractive old teak monastery at Sae Ta Lone where you may be invited inside for refreshment. The head monk is very proud of the education they provide and their students, many of whom have gone on to do well in higher education. The walk ends at the main highway where you will meet your transport near the monastery of Myaing Gyi. You will then return to Pyin Oo Lwin. Day 4 - Train to Naung Bein across the Gokteik Viaduct - 4 hours. Return to Pyin Oo Lwin. This morning you will drive the short distance to Pyin Oo Lwin railway station, to catch a local train for a scenic journey to Naung Bein crossing the impressive Gokteik railway viaduct. The view from the train is fascinating and the scenery is beautiful, passing through rural countryside with close-up views of small villages, hill top pagodas and people working in the fields. You'll make a couple of stops along the way, offering a chance to stretch your legs and witness the lively exchanges between train passengers and sellers hawking their wares, which vary from rice and noodle dishes, to snacks of hard boiled quail's eggs and even local herbal remedies. Around three and a half hours into your journey the train slows and the dramatic Gokteik Railway Viaduct comes into view. In 1901, when the Pennsylvania Steel Company built the viaduct, it was the second highest bridge in the world, spanning a deep gorge 102m/335ft to the river below. The train slows right down to make the 690m/2,264ft crossing giving you plenty of time to capture some spectacular photos and enjoy the creaking of the girders beneath! Shortly after crossing the bridge you will alight from the train and return by car to Pyin Oo Lwin where there is time to explore the town a little and perhaps visit some local houses, where families still produce Noe-chauk - a Shan delicacy consisting of strips of dried milk. You will visit the caves and waterfalls at Peik Chin Myaung on your return. Here there is an extensive cave system filled with statues and paintings of Buddha. Day 5 - Visit botanical gardens. Drive to Mandalay - 2 hours. City sightseeing tour. This morning you'll visit the National Kandawgyi Gardens - entrance fee payable locally. Set in over 400 acres, these botanical gardens are a further example of British influence in this area, being established in 1915 by an Englishman Alex Rodgers. In addition to attractive landscaped parkland the gardens house a large aviary, a butterfly house and enclosure of Takin (the national animal of Bhutan). Later you drive to Mandalay, a journe of around 2 hours.Mandalay is Burma's last royal capital. In contrast to the images evoked by its name in literature and song, first impressions of Mandalay can be a little disappointing. This is Burma's second largest city, with a population of over one million and the hub of economic activity across the north of the country. The roads are busy with trucks and cars and streets are lined with functional, but characterless buildings housing every type of commerce. However, Mandalay remains the cultural centre of Burma with over 700 pagodas and a number of key palaces, temples and monasteries: all supported by a wealth of crafts including wood carving, marble statuary, weaving, tapestry, and the creation of gold leaf. After lunch you visit Mandalay's most significant sights beginning with Mandalay Palace. Other monuments you will see today include Shwenandaw Monastery, an ancient wooden building with intricate carvings, which was once the home of King Mindon, Mandalay's founder. Continuing on you will see the 'world's largest book' a complete set of the Buddhist scriptures inscribed onto 729 marble slabs at Kuthodaw Pagoda. Dominating the town centre is Mandalay Hill, offering far reaching views right across and around the city and some interesting glass-studded temples. Your day ends with a visit to Shwe Kyin Monastery just before sunset to observe the student monks begin evening prayers. Day 6 - Visit Mahamuni Pagoda and walk in Shan Kalay Kyun village. Drive to Amarapura. Visit the Saigang Hills and U Bein Bridge. This morning you will visit Mahamuni Pagoda, home to Mandalay's holiest Buddha statue. Here the lower parts of the 4m/13ft high statue, i.e. those within reach of the pilgrims, are now encrusted with a layer of gold leaf around 15cm/6" thick. You will stop to see the stone carvers, seated on the pavement and in small open yards, producing fine marble statuary despite their seemingly less than perfect work conditions. At a workshop for gold leaf, small nuggets of gold, collected from rivers around the North of the country, are beaten into wafer thin pieces. Sold to pilgrims outside temples and pagodas, these small squares of gold are typically placed on shrines and figures of Buddha as an offering. You will then travel out into the countryside to explore some of the historic sites outside Mandalay, starting at Shan Kalay Kyun Village, located south west of Mandalay on an island. During the rainy season Shan Kalay Kyun is surrounded on all sides by water, but in the dry season water levels drop and the fertile soil is used to grow peanuts, corn, water melon, cucumber and many other vegetables. You'll enjoy a short walk here (up to one hour) and in and around some of the houses you will doubtless spot a number of local crafts in progress, from the sewing of tapestry and puppet costumes, to the carving of intricate decorative wooden panels, doors and windows. After lunch at a local restaurant, you will head up into the Sagaing Hills, a popular retreat for Buddhist devotees, where you can enjoy a magnificent view over the surrounding area. An interesting temple to see here is Umin Thounzeh, which is built in a crescent shape and houses 45 sitting Buddhas in a vibrantly coloured colonnade. You drive back to Amarapura, 10 miles (15 kilometres) out of Mandalay town to see the sunset at U Bein Bridge. In 1851, at the time when Amarapura was still the royal capital, U Bein Teak Bridge was built. Stretching some 1,200m/3,900ft across Taungthaman Lake this impressive structure is the world's longest teak bridge, supported by over 1,000 separate wooden posts. After time to walk out to the centre of the bridge and perhaps enjoy some refreshments at a tea stall, you return to Mandalay. Day 7 - Full day river cruise to Bagan – approx. 8 hours. (July departure only - variation due to water levels along the Ayeyarwaddy River - Visit Mingun by river boat, fly to Bagan). After an early breakfast at your hotel you make the short 20 minute transfer to the banks of the Ayeyarwaddy River to board your boat for a full day river cruise to Bagan. You will travel aboard one of two boats that ply this route, either the Shwe Keinnery or the Malikha. On board you will find a lounge cabin with comfortable seating, outside seating areas on two levels (including shaded areas), a small café and toilets. The scenery along the Ayeyarwaddy is timeless - oxen working the fields, water buffalo wallowing in the mud, golden pagoda spires, fishermen, villagers bathing in the river and, of course, every type of boat and river craft imaginable. Although dedicated to carrying foreign tourists your river boat may also be carrying some cargo and it's possible that you'll pull in to shore two or three times to unload/load bundles of crops, fuel or other supplies. The boat travels at a very slow pace and this journey normally takes a full day, allowing you to enjoy a relaxing break from your itinerary of walking and sightseeing. Assuming your boat runs to schedule there may be time upon disembarking to watch the sun set over the Bagan temples, before driving on to your hotel. After breakfast at your hotel you make the short 20 minute transfer to the banks of the Ayeyarwaddy River to board your boat for a short cruise to reach Mingun. The scenery along the Ayeyarwaddy is timeless - oxen working the fields, water buffalo wallowing in the mud, golden pagoda spires, fishermen, villagers bathing in the river and of course, every type of boat and river craft imaginable. Alighting from the boat you will pay a visit to the 50m/165ft high, brick built Mingun Paya. This giant, unfinished pagoda would ultimately have become the world's largest had its instigator, King Bodawpaya, not died before completion. Another curious sight here is the world's largest bell. Returning to Mandalay you make your way out of the city to the airport for an afternoon flight south to Bagan. Depending upon your flight schedule there may be time upon arrival to watch the sun set over the Bagan temples, before driving on to your hotel. Whilst there are conflicting accounts of the number of temples located across the 16 square miles (41 square kilometres) of Bagan (varying from 1,800 to 4,000) the importance and splendour of this archaeological site is indisputable. The majority of monuments that you see today, date from between the 11th and 13th Centuries, when Bagan was the capital of the first Burmese Empire. Although with a cursory glance it may appear that one architectural form dominates there is actually a fascinating variety, from giant monolithic structures to small stupas standing not much taller than a human and with interiors filled with statues, or with walls adorned in beautiful paintings. The original settlement in Bagan was famously 'cleared' by the government during the late 1980s/early 1990s. Villagers were forced to relocate to 'New Bagan.' Today, therefore, apart from temples 'Old Bagan' is primarily the site of a few hotels, tourist restaurants and the grandiose (if somewhat out of place) archaeological museum. The other main settlement in this area is the river port of Nyaung U. Day 8 - Bagan temple visits and sunset walk - 2-3 hours. Located in Burma's dry zone, temperatures in Bagan are typically higher than in areas such as Mandalay and Inle Lake. The best time to explore on foot is therefore in early morning, or late afternoon. Today you will have an early breakfast with the aim to start a morning walk at around 8.30am. Before starting your exploration of the site you will first pay a visit to the busy local market near the jetty where your boat docked yesterday. Fish and other river produce are much in evidence here, but also vegetables, household goods and clothing. From the market it's a short walk to the large gilded Shwezigon Pagoda built by King Anawrahta in the early 11th Century. Moving on you will visit Ku Byauk Gyi, a temple with exquisite murals of Buddhist folklore (Jataka) scenes, and Ananda Temple with four huge standing-Buddha images and numerous seated figures arranged around its interior gallery. After lunch at a local restaurant there will be a little time to relax before taking an afternoon walking tour. Walking is perhaps one of the best ways to explore Bagan, offering the chance to get away from other visitors and see less visited temples and other points of interest. The Bagan plain is scattered with acacia and toddy palm trees, bullock carts, zebu cattle, goat herds and villages: the opportunities for taking great photographs are unlimited. The area you will explore this afternoon lies to the east of the site and a 2 to 3 hour walk will take you from Old Bagan via a couple of pagoda complexes to reach the massive Dhammayangyi Phato. Built by King Narathu in the 12th Century, legend has it that he dictated that mortar should not be used to build the brick structure and that furthermore the bricks must fit together so as not to allow a pin to pass between them - see what you think of the craftsmanship. Your walk starts with a visit to Minnan thu Village, then to Lay Htaung Kan pond, and on to reach the Lamyetnha group of temples. You continue to the Paya Thone Zu pagoda complex, Sin Byu Shin complex, Sue La Ma Ni Pathto, and then to Dhammayangyi Phato. You will reach Shwe Nan Yi Taw for sunset. Day 9 - Morning temples walk - 3-4 hours. Afternoon visit to Nat Htaung Kyaung. You begin your walk today by passing through the ruined city walls of Old Bagan at Tharabar gate. In the niches on the eastern side of the gate you will see two statues representing Nat (spirits). A total of 37 Nat are worshipped in Burma and you will see local people stopping here to make small offerings before continuing on their way. Within the city walls you will see Pitaka Taik, originally built as a library, before walking across to Thatbyinnyu Temple, the tallest in Bagan. Close by is Nat Hlaung Kyaung the only Hindu Temple in the group and opposite Nga kywe Nadaung, one of the oldest stupas in Bagan dating from the 10th Century; the glazed green bricks used are still very much visible and it is a perfect example to show the evolution of the stupa. The final temple before exiting the city walls on the southern side is the 11th Century Pahto Tha Myar where natural lighting illuminates a Buddha statue and some wonderful 11th Century frescoes can be seen. Reaching Mee nyein Gon, you make an easy ascent up to a platform on the temple for some fantastic views of the surrounding countryside and pagodas. At times skirting the main road and other times following sections of it, you arrive in Myinkaba Village, the centre for lacquer craftsmanship, perhaps Bagan's most famous export (apart from sunset photographs of temples of course). Here there is a chance for refreshment at a local tea-stall before visiting Mahua Paya, a Mon period temple with a large reclining Buddha almost hidden away at the rear of the temple and nearby Nan Paya. You will meet your vehicle here and return to your hotel for lunch. This afternoon you take an excursion to Nat Htaung Kyaung, a monastery famous for woodcarvings, built in 1781 by a group of monks. Here you can admire the monastery's collection of ancient Buddha statues and lacquer boxes, before taking a leisurely horse cart journey slowly across the plains as the sun goes down. Tonight you will take dinner at a local restaurant and have the chance to enjoy a traditional puppet show. Day 10 - Morning flight to Heho. Drive to Kalaw. Afternoon walk to Nangthe - 3-3½ hours. You make the short transfer to Bagan Airport this morning for your onward flight to Heho (1¼-1½hrs). Your flight is likely to touch down in Mandalay en route, but you remain on board whilst other passengers disembark and new ones board. Upon arrival in Heho, you will be met by a new vehicle and driver for the short one hour drive up from the plains to Kalaw, like Pyin Oo Lwin, a former British Hill Station at an altitude of 1,325m/4,356ft. There will be time to stretch your legs with a walk around the town which is home to a large population of Nepali and Indian Hindus. This afternoon, you will take a walk into the surrounding countryside, to the village of Nangthe. From Ni Paya Monastery, above the town your walk begins with a downhill stretch before levelling out to pass through terraced fields of ginger, garlic, tomatoes, beans, cabbages and orange groves. The ethnic group here are mainly Taungyoe and en route you will see their traditional way of life and agricultural ways. The surrounding hills are forested with pine trees and at the half way point you reach a Nepali homestead, which differs in style from the hill-tribe homes: here the family earn their living from a herd of 100 dairy cows. Continuing on and enjoying some lovely scenery, you reach Nangthe Village, mainly inhabited by Danu people who like the Taungyoe are Buddhist. Stopping for a quick refreshment of green or black tea (Chai) at a Nepali teashop, you head back towards Kalaw to rendezvous with your vehicle for the short transfer back to your hotel. This walk will take around 3-3½ hours and involves about 250m/820ft of ascent/descent. Day 11 - Morning walk to Myin Ma Ti - 3-3½ hours. Drive to Inle Lake. The air is noticeably fresher and cooler in Kalaw and there's time to enjoy this on a further walk this morning before making the short drive to Inle Lake. Your walk starts through pine forest and it is an hour or so before you see the first signs of real agricultural activity. As you pass through the villages of Ywa-pu, Lutpyin and Taung-gyi-chai you will see fields of potatoes, mountain rice, tomatoes, beans and other vegetable plots all cultivated by hand, ox or buffalo. The ethnic population here are mainly Danu and Myin Ma Ti's villagers are all farmers, earning 100% of their income from farming. You will likely see villagers on their way to and from the market in Kalaw where they will trade their produce for other essential everyday goods. Your walk ends at the Pagoda in Myin Ma Ti, which is well known for its 200m/660ft long limestone caves and it is here that your vehicle meets you. This walk will take around 3-3½ hours and involves about 300m/1,100ft of ascent/descent. You will probably have lunch in Kalaw before making the one and a half hour drive back down from the hills to reach Nyaung Shwe on the edge of Inle Lake. Locally known as 'Jetty Town', Nyaung Shwe is a bustling hub of activity for both locals and tourists alike. Here you will board one of the local motor-powered longboats which will take you across the lake for 20-30 minutes to reach your hotel. Day 12 - Inle Lake morning walk - 2½ hours. Afternoon boat tour. Inle Lake is a simply magical place; located at 1,000 m/3,300ft, its calm waters are dotted with Intha stilt house villages, floating vegetable gardens and fishing canoes against the back drop of the beautiful Shan hills which offer some delightful walks. Motorized boats are the means of transport across the lake although the Intha people get around in traditional flat bottomed boats using a unique and skilful form of leg rowing. Your guide will plan which walks to take today and tomorrow in light of the rota of the 'Five Day Market.' This market is a particular feature of life on Inle Lake and rotates between several villages on the lake, and as the name suggests, every five days. Depending upon the schedule during your visit you will make a market visit either today or tomorrow. A possible option this morning will take you initially to Thalee Oo Village, which in common with other lakeside villages has a water-based section as well as a land-based one, both with their own monastery. Navigating through the houses on stilts, you disembark at a jetty to begin your walk on a flat and shady bullock cart road through the heart of the village. Thalee Oo is an Intha village whose population lives mainly off the land growing peanuts, tomatoes, garlic, sugarcane, rice and vegetables. This walk is not only extremely pretty, with traditional bamboo houses on either side but also has good views across cultivated fields to Inle Lake and the Shan Hills behind. Stop and chat to some of the friendly Intha families whilst observing their day to day life. After 45 minutes walk through Thalee Oo, you stop at a local rice mill, made entirely from wood and see the process of separating grain, husk and bran. Climbing uphill for 30 minutes through a monastery, you reach the small Pa O village of Ywa Thit renowned for its weaving of bamboo baskets. After admiring the stunning view of Inle Lake and the Shan Hills from your vantage point, you descend for a few minutes before continuing along a flat path through the village of Alae Myaung back to the lakeshore and your boat. This morning's walk will take around 2-2½ hours and involve 200m/650ft of ascent. This afternoon, you will take a tour of the lake to see the many sights that make this such a picturesque area. These include: the famous leg rowers - local fishermen who use one of their legs to propel their small canoes across the water; typical floating gardens - built upon rafts of water hyacinth; entire villages built on stilts and of course shore temples and pagodas. An interesting stop you will make today is at Phaung Daw Oo Pagoda. This is the holiest site on the lake and houses five small Buddha statues so heavily covered in gold leaf that they appear more like golden footballs than golden Buddhas. Day 13 - Inle Lake morning walk - 3-4 hours. Afternoon visit to Inthein. Today's walk may take you along the trails above Nyaung Shwe, or from a village on the western shore of the lake, such as Tone La or Than Taung. The hills above this side of the lake are home to the Pa-O people, an ethnic group sometimes referred to as 'dragon' people because of the bright red and orange head wear favoured by their women. Many Pa-O villages lie some 5 or more hours trek from the lake shore, so you are likely to see some villagers on their way to or from the lake shore. The Pa-O usually take firewood down from the hills to sell and trade at market. They use the money that this brings to buy household goods to take back to their village. This morning you will walk for around 3-4 hours, on a fairly flat trail. This afternoon your boat will take you to Inthein village on the western side of the lake. Access to this area is via a long channel leading inland from the main lake. The journey here is particularly scenic and during later afternoon you may well see farmers bringing their oxen, or buffalo down to the water to cool off. Above the jetty and small village stands a partly ruined pagoda complex (Shwe Inn Thein Paya), reached via a long covered walkway. There are good views from the top and you can descend via an alternative route, bringing you back to the village through a mature bamboo forest. Day 14 - Fly to Yangon. Guided walking tour. There's a final boat trip across the lake this morning to return to Nyaung Shwe. A vehicle will meet you here and return you the short distance to Heho Airport (25km-1hour). It is then around a one hour direct flight back to Yangon (Rangoon). After checking in to your hotel your guide and driver will take you to the main downtown area in time for lunch. In the afternoon you will take a walking tour of the historic downtown area of Yangon (Rangoon), beginning at the river front. Facing the river are some of Yangon's most impressive colonial era buildings including, the Myanmar Port Authority, the General Post Office and the nearby Strand Hotel. Across the road, the banks of Ayeyarwaddy River are a hive of activity with porters loading huge sacks of rice, street vendors, trishaws and ferry passengers all going about their daily business. Moving on you enter Chinatown where unpaved streets are lined with old wooden shuttered houses and shop fronts. Here you will see Chinese medicine shops and the colourful vegetable, fruit, fish and meat markets. A short distance beyond lies the Indian Quarter, where the small side-roads are full of shops selling Indian spices and ingredients used in cooking. Shwe Bontha is perhaps the most photogenic of all the city centre streets, with its leafy sidewalks, pavement tea-shops and magnificent colonial buildings. This is the area where gold merchants buy and sell in a local version of a stock exchange. Walking through Mahabandoola Garden you will see Sule Pagoda and City Hall before walking north to Bogyoke (Scott) Market. Your walk will end at a café here, with time for those who wish to finish any last minute souvenir shopping in the market before your waiting driver takes you back to your hotel. If there was insufficient time on Day 2 to make the visit to Shwedagon Pagoda this afternoon's walk will be shortened slightly in order to allow for a visit today instead. Day 15 - Depart Yangon (Rangoon). After breakfast transfer to the airport for your international flight home. Day 16 - Arrive UK. Overall an excellent trip which was well organised. The guides were knowledgeable and took great care of our welfare and contributed greatly to our enjoyment of the holiday. The drivers were also very good and drove carefully on difficult roads. We learnt a great deal and now have a much greater appreciation for the 2 countries. The trip was all that we could have hoped for. The itinerary was excellent. The organisation was faultless, the transport modern and comfortable and the accommodation was of a high standard everywhere. This holiday visits a great variety of locations. It was lovely to see the tourist sites and also to see how people live and to get close to the local people. Nyi Nyi was an excellent guide. He made all the organisation look effortless and he was really knowledgeable about his country. This was our first trip with Mountain Kingdoms and in all respects it exceeded our expectations. The group size, 8 in our case, was just right. The itinerary along with the walking enabled us to gain a good insight into life in Myanmar and helped understand the influence that religion plays in people's everyday activities. We would thoroughly recommend this trip. We thoroughly enjoyed our first holiday both with Mountain Kingdoms and to South East Asia. The programme was packed and varied and we observed life in rural areas and in the busy cities as well as visiting numerous beautiful temples and pagodas. Our guide Zaw Zaw was very informative and friendly and patient and helpful when we fancied some retail therapy. Burma is a lovely place to visit as there is so much to see and the people were really friendly. We are delighted to offer an extension in Burma to visit Hpa-An, the capital of Karen State lying south east of Yangon. Hpa-An is a charming town set on the banks of the mighty Salween River, one of the great rivers of south east Asia which rises in Tibet and flows down to the Andaman Sea. This is an incredibly beautiful region of green paddy fields and dramatic limestone karsts. As an additional attraction extension you will stay at a charming boutique lodge, the Hpa-An Lodge, which offers a very high standard of accommodation in an idyllic setting. During your stay in Hpa-An you will take a boat rip on the serene waters of the Salween River, stop at a village to see artisan weavers in action and also visit the richly-decorated Kawhnat Pagoda. On your return to Yangon you will stop at the ancient city of Bagon with its many pagodas and temples as well as the very moving Taukkyan War Cemetery. We offer two versions of this extension, with one including a visit to the Golden Rock in Kin Pun. Extend your stay in Burma with a visit to the Golden Rock of Kyaikhtiyo, one of the most revered pilgrimage sites for Buddhists. Perched on the edge of a ledge at a height of 1,100m, the precariously positioned gold-plated boulder is said to maintain its balance thanks to a single hair of the Buddha being enshrined inside the pagoda. During your three-day extension, you’ll also visit pagodas, stop off at the Allied War Graves Cemetery at Htauk Kyan, see reclining Buddhas and drop in at local villages before returning to Rangoon for your final night in what will have been a memorable trip to Burma. Visitors to Bagan now have the opportunity to enjoy spectacular, sunrise views of the ancient Kingdom of Bagan in a hot air balloon. The world-famous archaeological site of Bagan is known for its marvellous sunrises, mostly enjoyed from the top of one of the monuments but a balloon flight gives you the chance to see Bagan from a bird’s-eye view. We offer two levels service - Standard and Premium - both include hotel transfers and post-flight celebratory celebrations, whilst the Premium Service also includes an exclusive breakfast, a pre-launch balloon tour and a CD of in-flight photos. Visit Angkor Wat, Ta Prohm, Angkor Thom, the Bayon and more. Each of these sites has its own individual charm. Flights to Siem Reap from either Burma or Bangkok. All entrance fees, guides and transport during your time in Cambodia. Three nights stay at a lovely Boutique hotel with a pool and friendly staff. Angkor Wat is the largest religious building in the world. The name translates to ‘The temple that is a city’ and after a visit to this amazing site you will understand why. During your four days here you will have the chance to spend time not only at Angkor Wat but also the atmospheric ruins of Ta Prohm where the jungle has taken over the temple, the epic Angkor Thom, the enchanting Bayon and much more besides. Each of these sites has its own individual charm and will leave you with memories to last a life time. Angkor could be described as a giant game of one-upmanship with each successive king trying to out do the previous with a larger and more impressive temple, culminating in Angkor Wat. This four day extension can be added on to all our Burmese trips and any of our holidays ending in Bangkok.